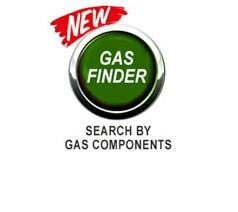 We offer a full range of gas detector calibration and repair services. Our models include RAE, BW, MSA, 3M, Gas Clip, and many others. Let our team show you the ease of working with experienced laboratory personnel whose main focus is you. 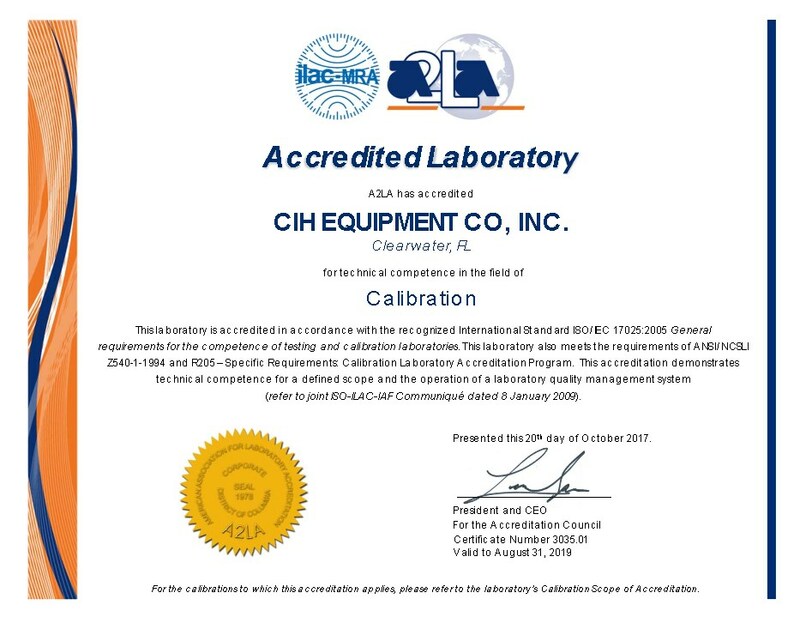 EGas Depot is a division of CIH Equipment Company, Inc. CIH Equipment is A2LA ISO 17025:2005 accredited for calibration of industrial hygiene equipment. You can also trust our gas detector calibration services for both precision and accuracy. Every year, we test and verify millions of data points applying our commitment to our people, processes, equipment, and systems. 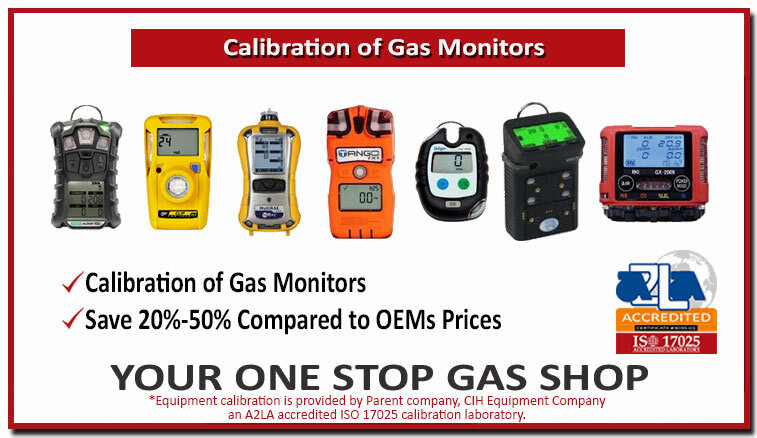 The key to accurate readings is gas detector calibration, says OSHA, and the agency notes the International Safety Equipment Association (ISEA) recommends, at a minimum, verification of sensor accuracy before each day's use. The only way to guarantee that an instrument will detect gas accurately and reliably is to test it with a known concentration of gas. Exposing the instrument to a known concentration of test gas will show whether the sensors respond accurately and whether the instrument alarms function properly. Gas detectors measure the concentration of a gas in an air sample by comparing the sensor's response to the response generated by a calibration gas of a known concentration. The instrument's response to the calibration gas serves as the measurement scale or reference point. OSHA warns the responsiveness of electrochemical sensors will vary with environmental conditions. Sensor response will be different (lower or higher) depending on the actual environmental conditions. Therefore, as much as possible, the monitors should be calibrated at environmental conditions that are the same as (or similar to) actual field conditions. Calibration at locations where the equipment is to be used is always preferable. Gradual chemical degradation of sensors and drift in electronic components that occur naturally over time. Chronic exposures to, and use in, extreme environmental conditions, such as high/low temperature and humidity, and high levels of airborne particulates. Exposure to high (over-range) concentrations of the target gases and vapors. Chronic or acute exposure of catalytic hot-bead LEL sensors to poisons and inhibitors. These include: volatile silicones, hydride gases, halogenated hydrocarbons, and sulfide gases. Chronic or acute exposure of electrochemical toxic gas sensors to solvent vapors and highly corrosive gases. Harsh storage and operating conditions, such as when an instrument is dropped onto a hard surface or submerged in liquid. Normal handling/jostling of the equipment can create enough vibration or shock over time to affect electronic components & circuitry. "Regular calibration is the only way to be certain that a detector is fully functional. Moreover, a standing policy for regular calibration sets the tone for a safety-conscious work environment and indicates to workers that safety is a priority. As a result, workers may be more likely to keep safety principles in mind throughout the workday," says the OSHA guidance. The agency reminds users that a "written record of calibration should be kept for the life of each instrument. This record allows users to quickly identify an instrument that has a history of excessive maintenance/repair or is prone to erratic readings." There are two methods of verifying instrument accuracy: a functional or bump test and a full calibration, each appropriate under certain conditions. A bump test verifies calibration by exposing the instrument to a known concentration of test gas. The instrument reading is compared to the actual quantity of gas present (as indicated on the cylinder). If the instrument's response is within an acceptable tolerance range of the actual concentration, then its calibration is verified. The agency recommends that users check with the detection equipment manufacturer for the acceptable tolerance ranges.) Instruments should be "zeroed" before the bump test in order to give a more accurate picture of the bump test results. When performing a bump test, the test gas concentration should be high enough to trigger the instrument alarm. If the bump test results are not within the acceptable range, a full calibration must be performed. A full calibration is the adjustment of the instrument's reading to coincide with a known concentration (generally a certified standard) of test gas. For verification of accuracy, calibration gas should always be certified by and traceable to the National Institute of Standards and Technology (NIST). In most cases, a full calibration is only necessary when an instrument fails a bump test or after it has been serviced. The full calibration and bump test should be conducted in a clean fresh air environment. In the past, there often has been confusion regarding proper calibration procedures and frequency. To clarify this issue, ISEA issued a position statement on instrument calibration that states, "A bump test or full calibration of direct-reading portable gas monitors should be made before each day's use in accordance with manufacturer's instructions, using an appropriate test gas." If the instrument fails a bump test, it must be adjusted through a full calibration before it is used. During a period of initial use of at least 10 days in the intended atmosphere, calibration is verified daily to ensure there is nothing in the atmosphere to poison the sensor(s). The period of initial use must be of sufficient duration to ensure that the sensors are exposed to all conditions that might adversely affect the sensors. If the tests demonstrate that no adjustments are necessary, the interval between checks may be lengthened, but it should not exceed 30 days. When calibrating an instrument, always follow the instrument user's manual for the manufacturer's recommended calibration frequency and procedure. "There is an inherent risk in many workplaces of injury or illness from respiratory hazards such as oxygen deficiency and the presence of toxic gases," says the OSHA guidance. "Detection technology and products exist to minimize such risk. Properly verifying the accuracy of gas detection equipment before each day's use will help to ensure that each worker finishes the job safely." 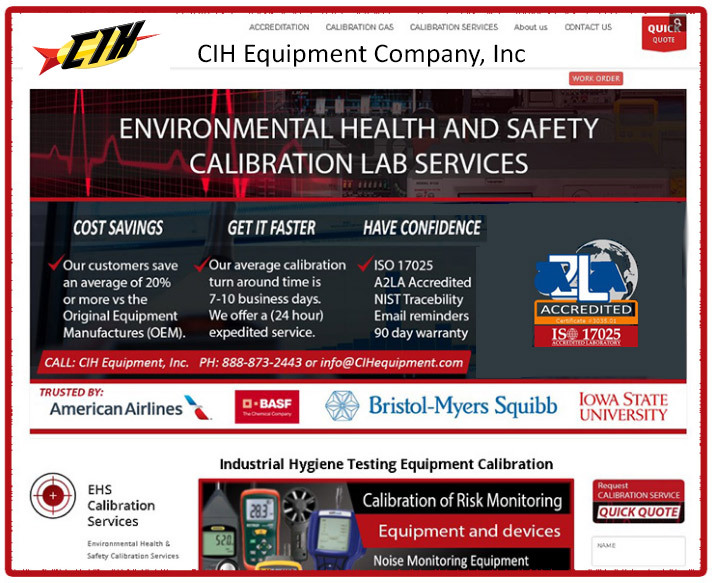 CIH Equipment also specializes in calibration labs that include aerosols, particles, sound measurement, noise, environmental factors, temperature, relative humidity, velocity meters, flow meters, air samples, light meters, vibration meters, accelerometers, ergonomic push pull testers, and dust monitors.